As in past years, in 2011 we used the vacant lot for performances and demonstration classes before the films. Here’s a blog post about the events, including a performance by The Bow Sim Mark Tai Chi Arts Association. WAY OF THE DRAGON [猛龍過江] (1972). 88 min. Bruce Lee plays Tang Lung, a young martial artist from Hong Kong who travels to Rome to help out at a friend’s restaurant. The local mafia kingpin wants the property and sends his thugs to shut down the restaurant. The standoff leads to a final battle in the Colosseum between Lee and a young Chuck Norris – one of the most famous cinematic smackdowns of all time! Written and directed by Bruce Lee. Starring Bruce Lee, Chuck Norris, and Nora Miao. In Cantonese. Thursday’s film will be preceded by a brief demonstration by students of Zhou Xuan Yun starting at 7:30PM. Zhou Xuan Yun has studied at the Wudang temple in China, and has been teaching at the Ultimate Fitness Gym (home of Nam Pai Academy) in Boston’s Chinatown. Watch a video of his work on Youtube. GALLANTS [打擂台] (2010). 100 min. A low budget indie film shot in 18 days with a cast of mostly over-the hill kung fu actors from the 70s, GALLANTS was a surprise hit in Hong Kong last year, and was named as “Best Film of 2010” by both the Hong Kong Critics Society and the Hong Kong Film Awards. An affectionate comedy about finding the soul of old Hong Kong in the modern day. Directed Derek Kwok, Clement Cheng. Stars Leung Siu-lung, Chen Kuan-tai, Teddy Robin. See Gallants Trailer on You Tube. In Cantonese. Friday’s film will be preceded by a demonstration by Wah Lum Kung-Fu Athletic Association, under the direction of Sifu Bob Rosen, starting at 7:30PM. THE YOUNG MASTER [師弟出馬] (1980). 106 min. Jackie Chan is an orphan raised in a kung fu school. When his older brother runs off to join a gang, Jackie volunteers to bring him home, which brings him into conflict not only with the gang, but also with the police, who mistake Jackie for his brother. Written, directed by Jackie Chan. Starring Jackie Chan, Shek Kin, Yuen Biao, Lily Lee. In Cantonese. Saturday’s film was preceded by a demonstration by Bow Sim Mark Tai Chi Arts Association, starting at 7:40PM. 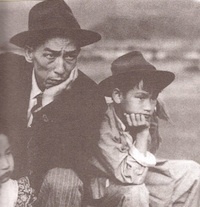 THE KID [細路祥] (1950). 77 min. Bruce Lee plays Ah Cheung, an poor orphan living with his uncle and cousins. Their fortunes seem to improve when a rich man (played by Lee’s real-life father) crosses their path, bringing new opportunities. But soon complications arise, leading to Ah Cheung joining a gang which plans to rob the rich man’s factory. Directed by Fung Fung. Starring Bruce Lee, Yee Chau-shui, Lee Hoi-chuen, and Fung Fung. In Cantonese. A MOMENT IN TIME (2010). 60 min. A documentary about the experience of the Chinese in San Francisco’s Chinatown, told through the films they loved. This retrospective film retells the immigrant story, and revives the emotions felt by audiences in Chinatown’s theaters. An uplifting reflection on how cinema shaped community, and a tribute to Chinatown theater movie-goers. Directed by Lambert Yam and Ruby Yang. In English.